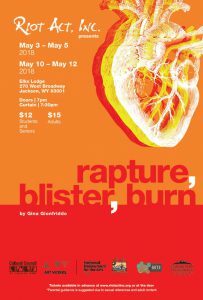 Rapture, Blister, Burn by Gina Gionfriddo – Riot Act, Inc.
Riot Act Inc.’s final full-length production of our 15th season, Rapture Blister Burn by Gina Gionfriddo, runs May 3-5 and 10-12 at the Elks Lodge in downtown Jackson. After grad school, Catherine and Gwen chose polar opposite paths. Catherine built a career as a rockstar academic, while Gwen built a home with her husband and children. Decades later, unfulfilled in polar opposite ways, each woman covets the other’s life, commencing a dangerous game of musical chairs—the prize being Gwen’s husband. With searing insight and trademark wit, this comedy is an unflinching look at gender politics in the wake of 20th-century feminist ideals.~ DPS. Helmed by co-directors BJ Hanford and Kathleen Godines, the show boasts a wonderful cast including, Delia Compton, Chris Eichelberger, Macey Mott, Linda Rode, and Jessica Schiers. Tickets are available in advance online at www.riotactinc.org or at the door and cost $15 for adults or $12 for students/seniors.